In the 1960s, some 50 years after German researcher Alfred Wegener proposed his continental drift hypothesis, the theory of plate tectonics gave scientists a unifying framework for describing the large-scale motion of the surface plates that make up the Earth’s lithosphere — a framework that subsequently revolutionized the geosciences. How those plates move around the Earth’s surface is controlled by motion within the mantle — the driving force of which is convection due to thermal anomalies, with compositional heterogeneity also expected. However, the technical challenge of visualizing structures inside an optically impenetrable, 6,371-kilometer-radius rock sphere has made understanding the compositional and thermal state of the mantle, as well as its dynamic evolution, a long-standing challenge in Earth science. Scientists treat the mantle as two layers — the lower mantle and the upper mantle — separated by a boundary layer termed the mantle transition zone (MTZ). Physically, the MTZ is bounded by two seismic-velocity discontinuities near 410 km and 660 km depth (referred to as 410 and 660). These discontinuities, which are due to phase transitions in silicate minerals, play an important role in modulating mantle flow. Lateral variations in depth to these discontinuities have been widely used to infer thermal anomalies in the mantle, as mineral physics predicts a shallower 410 and a deeper 660 in cold regions and a deeper 410 and a shallower 660 in hot regions. To explore this idea, Yu and his colleagues used a seismic technique involving the analysis of underside shear wave reflections off mantle discontinuities — known as SS precursors — to study MTZ structures beneath the Pacific Ocean around Hawaii. Cartoon of thermo-chemical mantle convection. Brighter colors represent compositional mixing and unmixing by currently active convection, while the faded colours symbolise older heterogeneity in the background mantle. When a cold oceanic plate (blue arrow) subducts deep into Earth’s mantle, its rheological strength prevents the separation of basaltic crust and harzburgitic melt residues. Once heated in the deep mantle, however, their differential density can lead to separation and, over time, the formation of a mechanically mixed mantle. 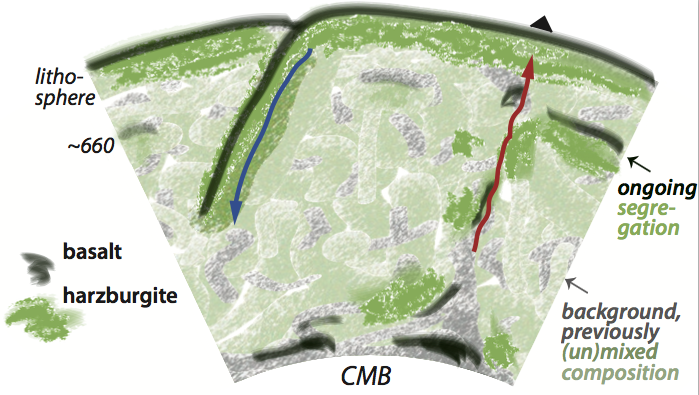 Some basalt may segregate on top of the core-mantle-boundary (CMB) because at those pressures a basaltic composition is denser than harzburgite. In low-viscosity upwellings (red arrow), segregation can also occur near 660 km depth because harzburgitic components remain in a dense lower-mantle composition longer than basalt. Over time this can form laterally heterogeneous harzburgitic and basaltic accumulations around 660, replenished at upwellings and disrupted by downwellings - courtesy: Yu et al. Yu’s co-authors are Elizabeth Day, a former postdoc in the Hilst Group who is now a senior teaching fellow at Imperial College; Maarten V. de Hoop of Rice University; Michel Campillo of the Institute of Earth Sciences in France; Saskia Goes and Rachel Blythe of Imperial College; and Professor Robert van der Hilst, head of the MIT Department of Earth, Atmospheric and Planetary Sciences. This work was funded by the Simons Foundation, the National Science Foundation, National Environmental Research Council, and a Royal Society Fellowship. Looking Deep in the Earth - Video by Helen Hill, MIT From the EAPS video archive: An interview with co-author Lizzie Day made when she was a postdoc at MIT.